Size : 21.3 x 23.0 mm. Weight : 4.93 grams. Grade : aXF but slightly rough and mint mark not visible. Obverse : Head of Constantius Gallus right, with DN FL CL CONSTANTIUS NOB CAES around. Reverse : Helmeted soldier standing left, holding a shield and about to spear a fallen horseman, with FEL TEMP REPARATIO around. 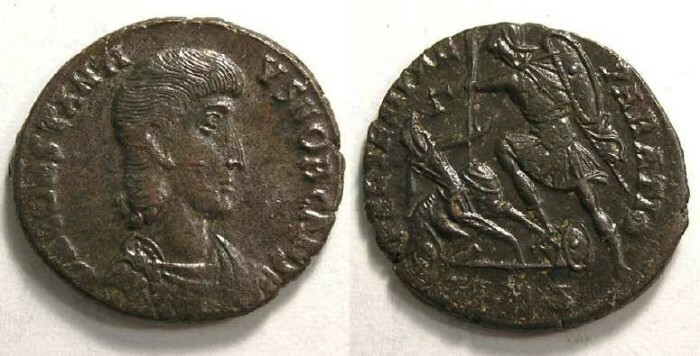 There is a 'Gamma' in the upper left field, and a 'delta' officina mark, which shows this coin to be from an eastern mint, but the full mint mark cannot be read due to rough metal in that position.